Construction is in progress. The expected completion date is Fall 2019. Drilling caissons for the bridge foundation on Douro Street. The City of Toronto has started construction on the pedestrian/cycling bridge over the Metrolinx Kitchener / Milton Rail Corridor in the summer of 2018. 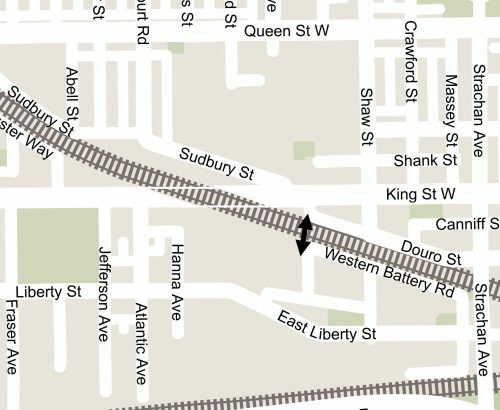 The bridge will span from Douro Street to the western leg of Western Battery Road. 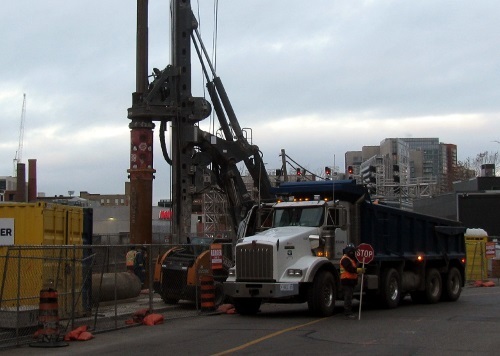 This new bridge will provide a convenient and more direct route from Liberty Village to King Street West between Atlantic Avenue and Strachan Avenue. The project is part of the Council-approved 2018 Capital Works Program. A five metre wide covered and mostly enclosed deck will span the entirety of the 55 metre wide Metrolinx rail corridor. Access to the bridge will be provided by a staircase (with a bicycle channel) on each side, as well as elevators for barrier-free access. All passageways and approaches will be illuminated for 24 hour access. Security measures, such as closed-circuit cameras, open stairs (for visibility) and emergency call buttons. Public art will be included in the design of the glass for the elevator towers at both ends. The location and general design of the bridge was endorsed by City Council in December 2011. Further details on the bridge design, construction and public consultation history is available below.